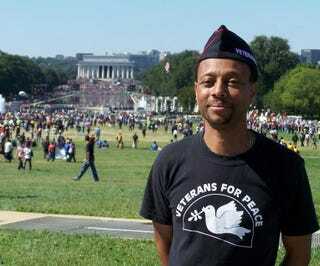 Michael T. McPhearson at the One Nation Working Together Mobilization in Washington DC on October 2, 2010. Memorial and Veterans Days come with mixed feelings for veterans like me, especially as we witness how most Americans ‘celebrate’ these holidays. The purpose of Memorial Day is to remember the dead. Some choose to only honor service members. Others, like me, choose to honor all lives lost due to war. This includes the countless veterans who have died by suicide, or by disease stemming from Agent Orange, depleted uranium and other war related poisons, as well as those who died from addiction or self-destructive behaviors driven by the haunting ghosts of war. I also honor the civilians who have perished in the crossfire of war, and who endure the same conditions in the aftermath that kill veterans. And yes, I honor the enemies who sought to kill me and my brothers and sisters in arms, because I know that the gods of war revel in all sacrifices, making no distinction between the good and bad guys, or civilians and combatants. They drink the blood of all wounded by the chaos, suffering, hate and broken bodies and minds. Make no mistake, we are all victims of this bottomless hunger. While the public honors the millions of faceless and nameless service members lost, veterans remember comrades who died beside them in their arms, at a distance blown up by an IED, on hospital beds, and here at home after the wars supposedly end. Families and friends mourn loved ones who left them walking to return in a box, body bag or not at all. This is the essence of Memorial Day. And while mourners will laugh between tears as they remember the beauty, kindness and humanity of a comrade and loved one, the pain stays and happiness, at least for this day, remains elusive. While I am not against having fun at BBQs with family and friends as people enjoy the freedoms service members supposedly died to protect, I ask that people dedicate time to reflect on the meaning of the day. We owe it to those we claim to honor to think about how to end the scourge of war, and starve the beast that demands more blood and death. I walked into the Rayburn Congress building in D.C. last week to visit House members and found myself surrounded by walls in the entranceway displaying the names of U.S. service members who have fallen in the wars conducted by my country since September 11, 2001. For a time I was overwhelmed with grief. While I know I am suppose to be grateful, complacent and satisfied that veterans and current military serve to keep us all safe, and those who died made the ultimate sacrifice for our freedom, it simply does not ring true. In the middle of 22 veterans committing suicide a day, thousands homeless, a broken V.A. system and veterans who want jobs out of work, its hard to accept my service has been for the people. I no longer believe that my well-being and prosperity depends on a frenzy of organized killing and mass scale violence. I do not accept that children in foreign lands must die so that my grandchildren will not face horrors here at home. War profiteering and the greed and pursuit of power that drives war policies directly undermines the economic security on which true freedom depends. In the face of the growing disparity between rich and poor, with millions without healthcare or jobs, caught in poverty and under fear of domestic state violence, it seems like a lie that I served for freedom. All the while, we spend trillions on wars that displace millions of men, women and children. And, we have killed a conservative estimate of tens of thousands of innocent civilians caught in the crossfire. Much of the world is on fire, with possibly more war on the horizon. While I know that war will not end tomorrow, and that there are people in the world who wish me harm, I will honor the dead by struggling for peace in an effort to protect the living. The best way to ensure a prosperous, bright and peaceful future is to work to abolish war. Yes, we have a rough and steep road to travel, but I would rather die honoring life than devaluing it. This is what I rededicate myself to this Memorial Day. Michael McPhearson is Executive Director of Veterans For Peace, based in St. Louis, MO, and co-chair of the Don’t Shoot Coalition. Don’t Shoot formed in the direct aftermath of the killing of Michael Brown Jr. in Ferguson. McPhearson is a former Field Artillery Captain in the United States Army. He served in the 24th Mechanized Infantry Division during Desert Shield /Desert Storm, also known as Gulf War I. He is a Distinguished Military ROTC graduate of Campbell University in Buies Creek, North Carolina with a B.S. degree in Sociology.